We are pleased to release FreeFlyer 7.3, the newest major release of FreeFlyer, now available for download! There are multiple new features in this release, which we previewed in the previous blog post. Here’s the full detailed list of everything we’ve added this time around. Back in FreeFlyer 7.1, we improved the accuracy of timing precision from millisecond down to the nanosecond level. Doing so required significant design changes in FreeFlyer, including new scripting syntax for dealing with time itself. So we introduced two ways to create Mission Plans: Millisecond mode (legacy) and Nanosecond mode (new). 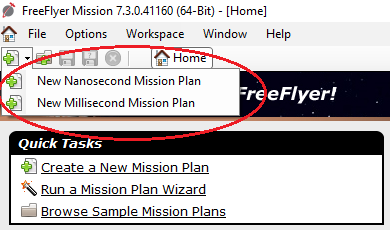 For FreeFlyer 7.1 and 7.2, we kept Millisecond mode as the default when creating a new Mission Plan to give users time to adjust and migrate to Nanosecond Mission Plans over time. Now with FreeFlyer 7.3, we have switched Nanosecond mode to be the default in FreeFlyer when creating new Mission Plans. Please note the important points here for future reference! When users click the “Create a New Mission Plan” link under Quick Tasks on the FreeFlyer Home Screen, the new Mission Plan will be created in Nanosecond mode. As always, feel free to reach out to us with any questions on this update or any other topics. We are available at techsupport@ai-solutions.com, or 301-306-1756 x2.